"This fantastic drink, developed by chief armchair scientists, is perfect for real men, or when all you can afford is whisky. Also, it gives you a good 'awake buzz'." Pour the boiling water into a coffee mug. Add tea bag and steep for 60 to 90 seconds. Pour in whiskey, milk and honey, and stir. Adjust amounts to suit your preference. See how to make a chilled down version of the toasted almond cocktail. Wonderful drink! Great mixture of everything wholesome and good in the world. The trick is to drink it in a large glass. Pretty good, personally I could have done without the milk. 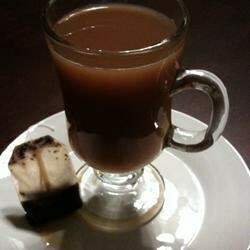 I served this to my husband who doesnt even like tea, and he loved this drink!! My picky teenage son also thought it was a big hit! !